Entering the 2007 season, Salgado has placed fourth in a 2006 SWATCH-FIVB World Tour event in Croatia with Roberto Lopes after winning two Challenger/Satellite bronze medals in 2005 with Ian Borges. Salgado and Borges won the 2002 SWATCH-FIVB U-18 World Championships at Xylokastro, Greece and placed third in 2003 at Pattaya, Thailand. Salgado teamed with both Pedro Cunha and Bruno Oscar Schmidt to win SWATCH-FIVB U21 World Championships in 2003 and 2006, respectively. Salgado and Cunha won the 2003 U-21 gold medal at Saint Quay Portrieux, France. Salgado and Schmidt captured the 2006 U-21 title at Myslowice, Poland. Salgado and Mois�s Santos placed third together at the 2004 SWATCH-FIVB U21 World Championships at Porto Santo in the Madeira Islands. 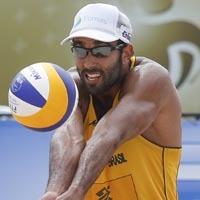 Salgado and Tiago Santos were fourth at the 2005 SWATCH-FIVB World Championships in Rio de Janeiro, Brazil. At 21 years, one month, eight days, Salgado became the fourth youngest player to win an "open" SWATCH-FIVB World Tour gold medal as he teamed with Harley Marques to capture the May 2006 China Shanghai Jinshan Open stop. The second of four children for Isabel, who won a SWATCH-FIVB World Tour women's event in 1994 on South Beach in Miami, Fla. Sisters Maria Clara and Carolina also compete on the SWATCH-FIVB World Tour and teamed to win an international bronze medal in the 2005 season finale in Cape Town, South Africa.